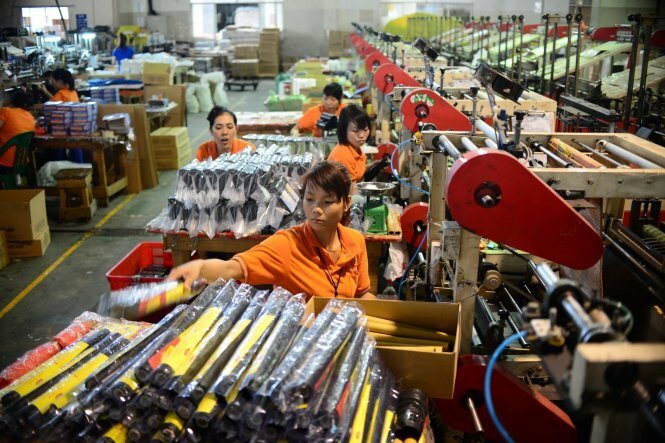 HA NOI (VNS) — The National Wage Council voted yesterday on a 12.4 per cent increase of minimum wage in the year to come. The vote came after a meeting held yesterday morning in Ha Noi between the Viet Nam General Confederation of Labour (VGCL) and the Viet Nam Chamber of Commerce and Industry (VCCI) failed to produce a consensus. With 14 out of 15 votes in support of the 12.4 per cent increase, workers across the country would receive an increase of VND250,000-400,000 (US$11-17.5) to their monthly wages next year compared to this year's, depending on where they live. The minimum wage debate came amid concerns that the recent depreciation of the dong would put in jeopardy this year's government's inflation target of 5 per cent. The General Statistic Office of Viet Nam reported an inflation rate of 2.19 per cent for the first eight months of 2015 compared to the same period last year. VGCL, who represented the labour force and VCCI, who represented the business sector, could not reach an agreement after their third meeting to date. VGCL had proposed an increase of 14.3 per cent, down from their previous demand of 16.8 per cent, citing this year's growth in GDP, exports and FDI as justification for the increase. VCCI maintained their stand on an increase of 10.7 per cent, saying that a greater adjustment would put a lot of strain on the business sector. Regarding the council's final decision, Chinh said while VGCL did not achieve its original objective Vietnamese workers were willing to shoulder the challenges faced by the business sector, their employers. Vice president of VCCI Hoang Quang Phong said that the 12.4 per cent increase will put a lot of pressure on the country's business sector. He noted that it will also push businesses to step up their global integration effort and improve productivity. The previous two meetings had ended without a consensus reach between VGCL and VCCI, which prompted Prime Minister Nguyen Tan Dung to instruct the National Wage Council to settle the matter if they failed to reach an agreement.